I managed to ingest an astonishing quantity of food in the first thirty six hours of my short break in Bologna that I had to find a way of working it off - just so I may make room for some more food. 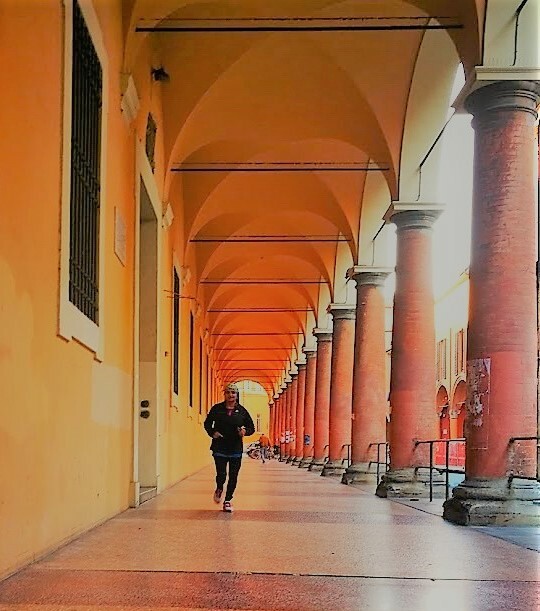 I took myself off on a run on the second morning of my stay but it was working day and Bologna was all bustle and smoke on its way to work and school. After taking a small tumble (okay, large fall complete with an ugly shriek and the mandatory dusting of knees while ensuring that no one caught my ungracious spill) that morning, I repaired to the hotel room and took comfort in its sumptuous breakfast. 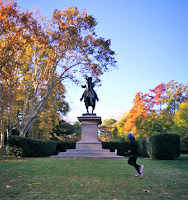 But I had to find a more fun way of getting exercise while taking in the sights of this city steeped in history. 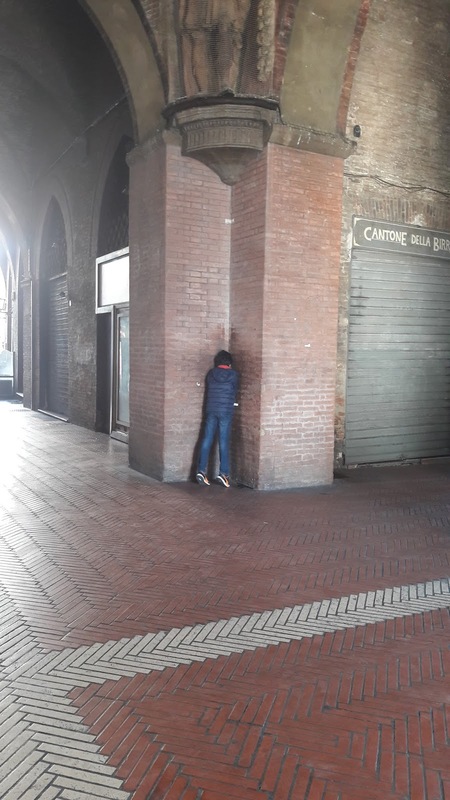 Luckily for me, Bologna By Run - a company that offers running tours around the city - had a place free for me the following day. It turned out that the next day was a national holiday and the roads which had been choking with traffic the previous day were mercifully quiet and empty. My guide Andrea met me bright and early at Piazza della Mercanzia as much of Bologna was still recovering from a night of Halloween excess (apparently, we are all American now). 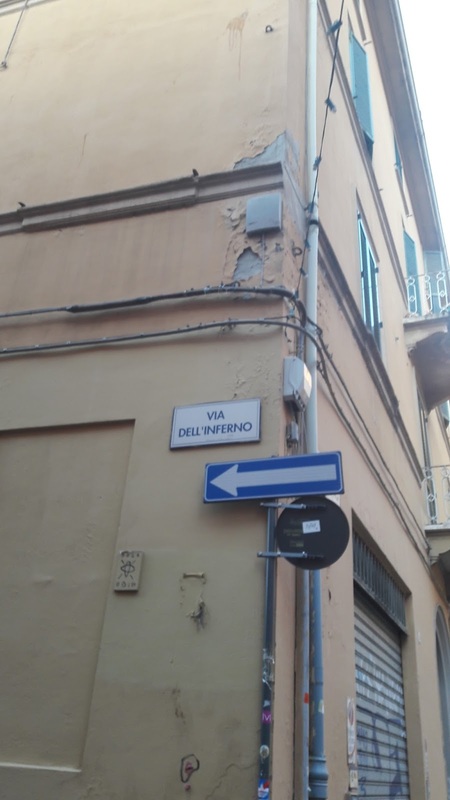 He took me around the Jewish quarters which has an alleyway named Inferno and a stop over at what was once a synagogue which now serves Indian food (please don't strain yourself trying to look for any jokes there). 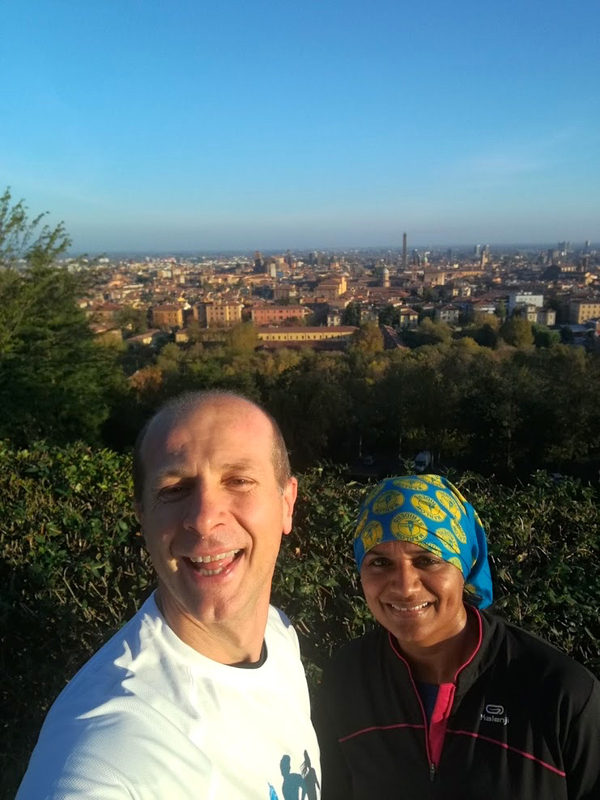 We ran past a little jewel of a museum dedicated to musical instruments and climbed up the small hill that overlooks the city and offers stunning, sweeping view of its tiled roofs. The city was suffused in glorious morning light that I had to pause to take a selfie. We ran through the city's main garden Giardini Margherita (whose name gave me a good idea for what I would be having for lunch), past the church of Saint Domenico which hosts three sculptures by Michaelangelo and through the temples of modern Italy where people worship at the altar of Saint Gucci and Saint Prada. 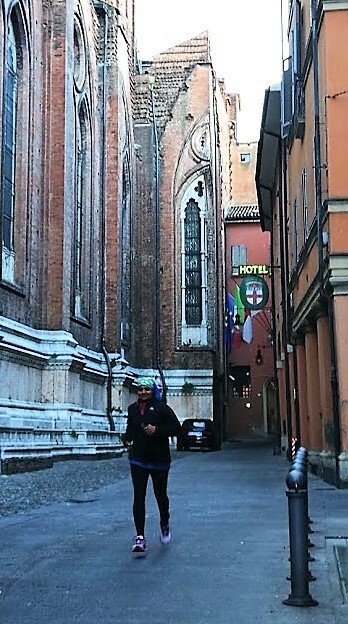 I ran along side the city's main church Saint Petronio while listening to a story of how it was stopped from becoming one of the biggest in the world, then stood in one corner of an archway with my back turned to the wall while Andrea whispered from another wondering whether I liked his running tour. Marvellous medieval acoustics meant I could hear his question loud and clear as if he was standing next to me. My response to his question was a resounding, yes, indeed. Andrea had planned the tour and paced the run to suit me. He was meticulous with the arrangement, following up on initial enquiry, arranging the meet up point, turning up ahead of time, going over any concerns, putting me at ease and expertly guiding the tour. As a local he knew the place like the back of his hand and our conversation was freewheeling and easy. There's something about exploring a new place through the eyes of a long-term local resident who can offer so many more insights. Couple that with a gentle jog and you've got a memorable experience. The next time you're in a new town, why not lace up and go for a guided running tour? 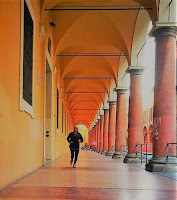 I booked my tour with Bologna By Run who can be found at www.bolognabyrun.com. This is not a paid review. Images that feature me were courtesy by Andrea of Bologna By Run.